I have been lucky enough to have done a lot of traveling in my life, both overseas and here in the US, and one of my favorite things to do when in a new place is to talk to a local and find out where they go for food and fun. They know all the great little places to eat and drink, the attractions that are more than just for tourists, and the best places to watch a show. Some of the most fun experiences I have had on vacation were at small, local venues, fairs and community festivals. 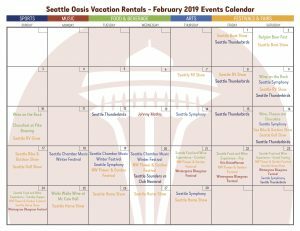 In fact, most of the staff here at Seattle Oasis Vacation Rentals have travel in common; between all of us, we’ve been not only all over the world, but visited all 50 states here at home! So, with that in mind, we decided to take our combined love of food, drink, music, sports, and festivals and make a calendar for our guests. Every month we’ve listed some of the events we think you might like to check out while here. But winter in Seattle? Most people think of rainy, dreary days – and to be honest, there are a lot of those. But there are quite a few indoor activities to be found, there’s something for everyone. January and February are the biggest Show months: we have the NW Garden Show, the Home Show and the Boat Show just to name a few. And while major league sports aren’t huge this time of year, there are a lot of College, AAA and minor league teams playing all over the city. We have sports bars that show Soccer, Hockey and Basketball from here and abroad. And don’t forget museums, theaters, and arts performances; lines are shorter, and tickets are more readily available. Many of the vendors at the Pike Place Market are open year-round. Yes, you will need a jacket, but it’s covered so you won’t get rained on. There are also several really amazing food and beverage festivals as well, how about the Chocolate and Bourbon festival or the Seattle Food and Wine Experience? 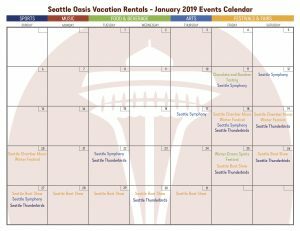 Please click on this link, or one of the images above, and it will take you to our Events Calendars page on our website where you can download the monthly calendar. The events listed have links to their website or where you can purchase tickets. And if you find an event you just HAVE TO experience, why not stay with us for your visit? We have comfy, well-stocked units in the heart of downtown Seattle. Why not make life easier and stay where you can walk or Lyft to your night out? And if you have questions about other things to do or need information about anything Seattle, don’t hesitate to contact us!